Approaching storm at the 2013 Arnold Palmer Bay Hill Classic. Probably the most aggravating tournament scenario in golf has to be a Monday finish when the Sunday finale isn’t possible due to rainouts, other inclement weather, or darkness. No one can be happy: the players have to deal with one more day of ‘night-before’ stressful jitters; the spectators won’t get to see what their Sunday up-close-and-personal premium ticket should have yielded….like a conclusion; the TV crew and network not only lose out on a hopefully exciting finish with fans flocked around their television coverage – but now have to also scramble to fill the time as well as change their Monday plans to accommodate the reschedule. Not only that, if there was a media day planned for the press to play when the tournament concluded, that too is out the window for the dedicated scriveners. Oh, the cruelness of life as a golf writer! In an unusual show of Mother’s Nature’s harsh sense of irony, her 62-mph almost-hurricane force winds and torrential rains, about 1 and 1/2-inches, have prevented the completion of Arnold Palmer’s 2013 Bay Hill Classic. It is also delaying another whirlwind of an event: the ascension of Tiger Woods back on top officially as the world’s #1 player. 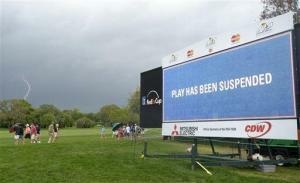 Many expected to see that happen but will have to wait until the Monday finish when play will be resumed at 10am. Could this be the turning point that Tiger has been waiting for? The calm after the symbolic storm? It appears that Woods is finally settling down a bit after his life’s upheaval began on November 27, 2009, unraveling his marriage, his personal life, his other-worldly game, his sponsors, his career, but most noticeably – his confidence. Many expect him to win this event – his eighth victory at Bay Hill. With a 3-shot lead over Ricky Fowler, Keegan Bradley, John Huh, and Ken Duke, if Woods is truly getting back into the form at which the golfing world marveled only a few short years ago, the championship is a done deal. 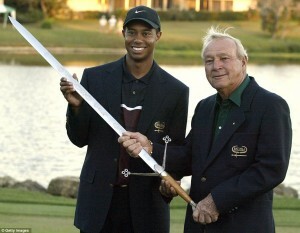 Arnold and Tiger with the Bay Hill Champion's sword. Tiger never loses in the stretch once he has the lead in tow. Over the last few years, disillusioned golf fans dropped their adoration of Tiger Woods, but no one can honestly admit that the game was better for it and didn’t suffer, as participation numbers slid downhill. If Tiger should win at Bay Hill, and either takes the green jacket or performs like old times at Augusta National, watch for a renewed interest in golf – a badly needed uptick. Everyone loves a winner…..but people love a comeback – a redemption – even more. Course Conditioning: Harmful or Helpful?